Australia’s first amphibious Gold Coast city tour commenced operations in 1996. 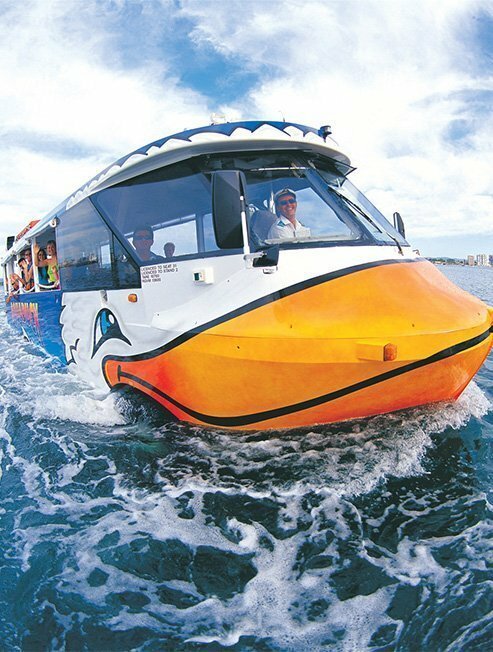 The famous amphibious ‘Duck’ vehicle with its big yellow beak is now a famous Gold Coast icon. Departing from Cavill Avenue, rides aboard the ‘Duck’ combine informative Surfers Paradise city-tours with unique and exciting Gold Coast river cruising. 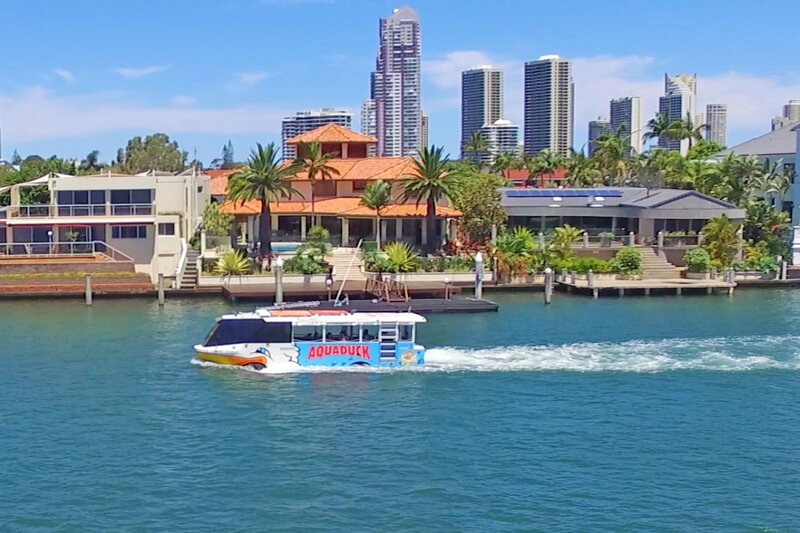 With live commentary on board, Aquaduck is a great way to see the Gold Coast. You will learn about the history and landmarks of Surfers Paradise along the esplanade and see one of the world’s most famous surf breaks. Then spot celebrities at one of the many cafes along trendy Tedder Ave as we make our way to the Broadwater to begin the waterways cruise part of the tour. Be amazed as the bus instantly transforms into a boat and your waterways cruise begins. The Aquaduck has a unique seating layout offering you more room to stand and move around once we are on the water, along with great views. The Gold Coast is a beautiful part of Australia, and your tour aboard the Aquaduck allows you to see more than you would on even the longest boat cruises. Cruise past the glitzy waterfront mansions of the rich and famous and take in the spectacular views of the Gold Coast canals and Broadwater with its famous sights and natural wildlife. 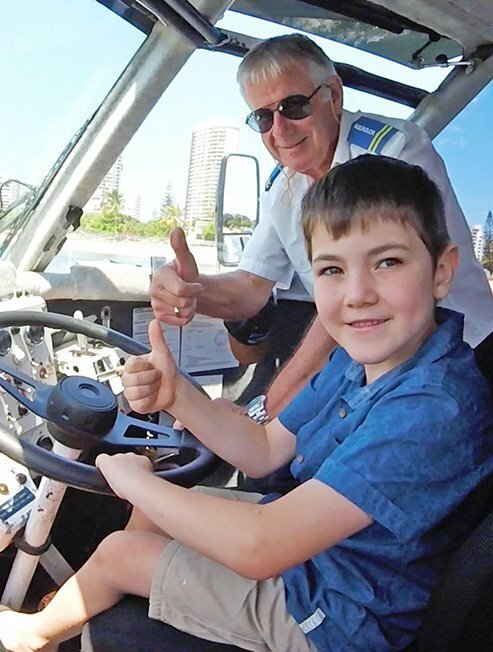 Kids will also have the opportunity to drive the Duck on the water and take home their own Captains certificate. It really is the ‘must do’ activity for visitors and locals alike. A tour aboard the Aquaduck is a safe and enjoyable activity for customers of all ages. Drive past the Iconic ‘Surfers Paradise’ sign on one of Australia’s most famous beaches. Watch in awe as the amphibious ‘Duck’ splashes into the Broadwater. Look out for Dolphins and other wildlife on your waterways cruise. See the super yachts as you pass the Palazzo Versace hotel and. watch the roller coaster at Sea World. Cruise past the mansions of the rich and famous. Look back at the Surfers Paradise skyline from the river cruise. Celebrity spotting through Tedder Avenue at Main Beach. 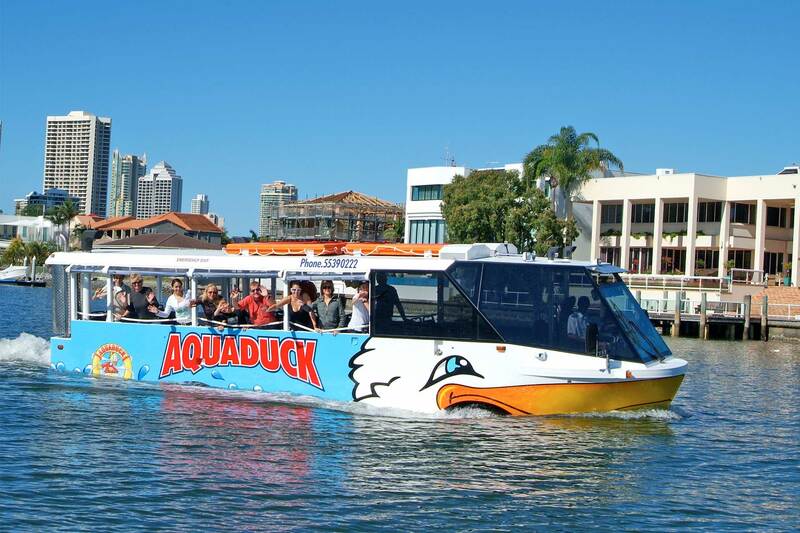 Aquaduck is Australia’s original amphibious tour with over 2.2 million happy customers. We look forward to seeing you on the Duck soon for the famous Gold Coast city tour. Most reliable, well maintained and largest amphibious vehicles on the Gold Coast. Lifejackets onboard for all guests. Safe and fun for babies to seniors and everyone in between. Secure storage for prams and luggage. Multilingual safety cards on board.